Note: This article was written as a preface for a book of Advent Readings titled, Unto Us a Child is Born! 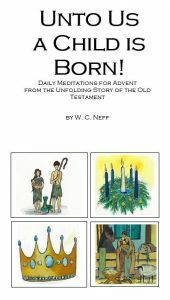 Daily Advent Meditations from the Unfolding Story of the Old Testament by W. C. Neff. Advent is the 3-4-week period leading up to Christmas. Historically, the Christian Church has celebrated or commemorated key events like the Birth of Christ (Christmas) and the Resurrection of Christ (Easter). But these events are often not merely single days on the Calendar, but rather, seasons. There are the twelve days of Christmas (between Christmas and Epiphany) and Passion Week (the week beginning with Palm Sunday leading up to Easter). In addition, there are seasons of preparation leading up to these events, and, when it comes to Christmas, Advent is the season of preparation for it. Advent means “coming” or “arrival.” It is the Season when we give special thought to the arrival of God’s Son, Jesus, to this earth in the form of a baby born in Bethlehem. Just as the planning and preparation leading up to an event (like a concert, a wedding, or a vacation) is important, so too the season of Advent is useful in helping our hearts reflect on the deep significance of Christ’s coming at Christmas. There is joy in the event itself, but there is also great joy in the preparation and anticipation leading up to it. Preparation helps us to enjoy the event even more! Our increasingly secular society prepares for Christmas, but Christians, above all, should prepare for it. After all, it’s our Holiday! 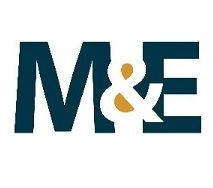 Our society uses it as a marketing platform to make money due to increased Christmas sales. But Christians profit differently; we profit by gaining Christ himself—by drawing near to Jesus, our one and only True Treasure. Preparing for Christmas during the season of Advent is a way of declaring Jesus to be our Supreme value in the middle of a world that seeks its value in temporary and trivial things. There is a word of caution to be added; namely, that Advent, or any customary practice for that matter, is to be a servant and not a taskmaster. There is nothing directly in the Scriptures about observing Advent. There is no requirement to do so. For that reason, some look on practices like this with suspicion, if not disdain. They may have come from a religious background in which outward displays of religious practice were devoid of gospel understanding and spiritual refreshment. When that happens, these things devolve into mere custom and observance, and sometimes even pride. There are dangers, I suppose, in just about everything one does or doesn’t do as a Christian; there are excesses on all sides that can be used by the flesh to promote ourselves instead of Christ alone. The important thing in all of this is to use all that we do– or don’t do– to draw nearer to Christ. If you don’t observe Advent because doing so would lead you away from Christ, then, by all means, don’t observe Advent! Keep doing what you are doing to savor Christ more fully. But if Advent can be a means by which you meditate more deeply on Christ and results in your gaining more of Him, then, by all means, use the Season to its fullest. The important thing is to gain more of Christ!